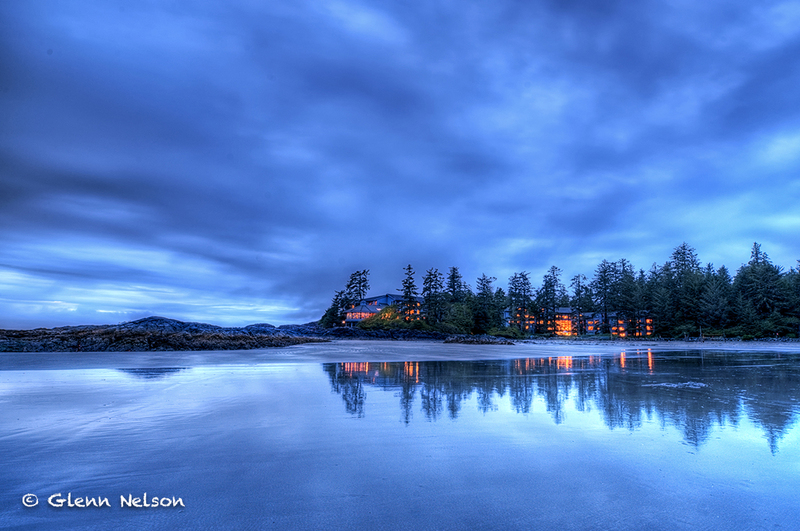 The Wickaninnish Inn, just after sunset. It didn’t rain every day, but it could have. It typically rains more in four days on the west coast of Vancouver Island than it does in one day in Seattle, where I’m from. But it rained enough. Moreover, clouds almost were ever-present. Which would seem a drag to most people, but not me. Yes, I was returning to Tofino, B.C., Canada, one of the most beautiful places I’ve ever visited, 10 years after my marriage there. But this time I had a couple bags of camera gear with me. (NOTE: Photos are not full versions; click to open a larger image in a separate browser window). So I was adhering to my new mantra: Allow your camera to lead you to beauty. And, as such, I regarded as a positive the presence of clouds, which give something for light to bounce off and play, during the most intense lighting moments of the day, sunrise and sunset. The sun sets on Chesterman Beach on our final night there. It can be difficult. Shooting sunsets means getting up early – especially when you have to jump in a car to get somewhere like I did a few times. This one meant getting up at 5:30 a.m., which is not terrible. When I got to the dock off First Street in downtown Tofino, everything was so still, I heard the chattering of a Kingfisher, which I then watched look for its breakfast. This may not completely reflect it, but the light was so grand, I was really glad to be up so early. As seen from the Tofino waterfront, the sun starts to peek behind Beck, Arnet and Stone Islands. On the other hand, catching sunsets means being up a little late, though summer is ending so we’re not talking 10:30 p.m. anymore. Still, sometimes the best light shows happen after the sun hides underneath the horizon. The lead photo of the Wickaninnish is one example. Here is another. I got to use the brand-new, mini-flashlight that I “won” earlier in the day, to set this up. 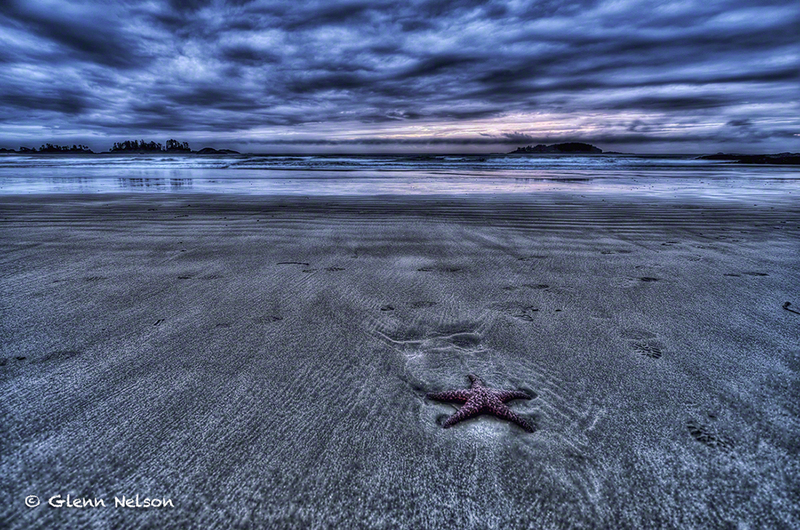 The sun and the tide is gone, leaving this sea star behind on Chesterman Beach. Photography requires sacrifice. The following was taken after an all-day drive from Victoria, B.C., then an all-you-can-eat crab feed. You tell me which was a bigger impediment. 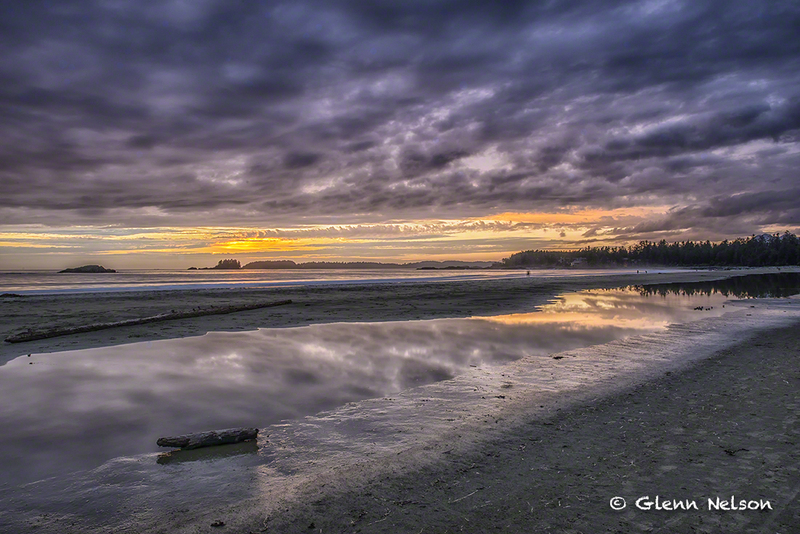 A bit after sunset on Chesterman Beach, near the Wickaninnish Inn. Of course, you’re never guaranteed success. Or even a suitable subject matter. 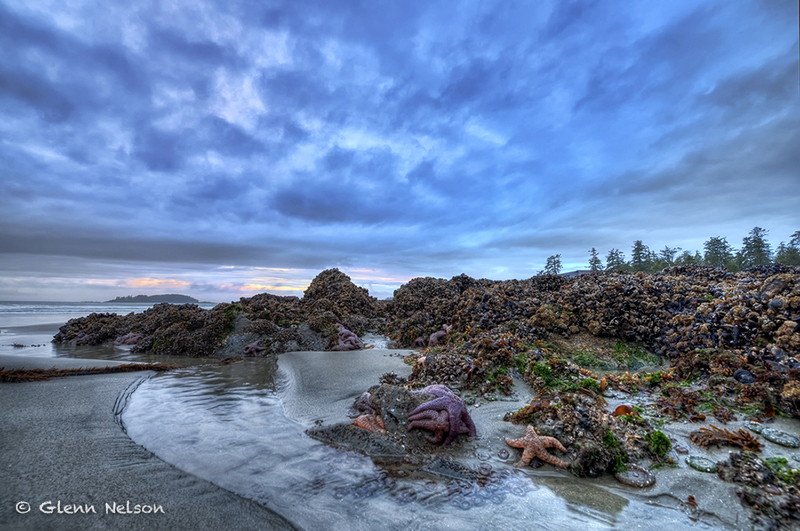 While staying at the breathtaking Wickaninnish, I went down to Chesterman Beach most morning and evenings to catch the good light. 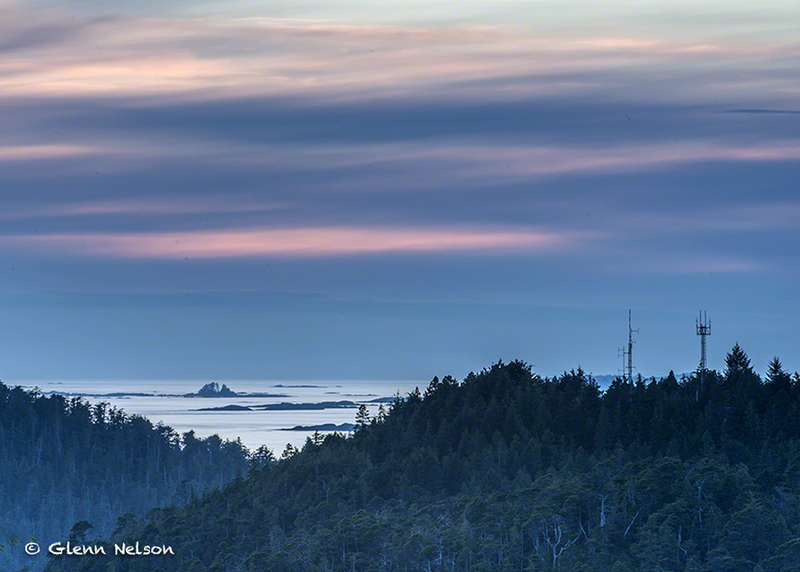 But, facing West, Chesterman is not the ideal place for a sunrise shot. 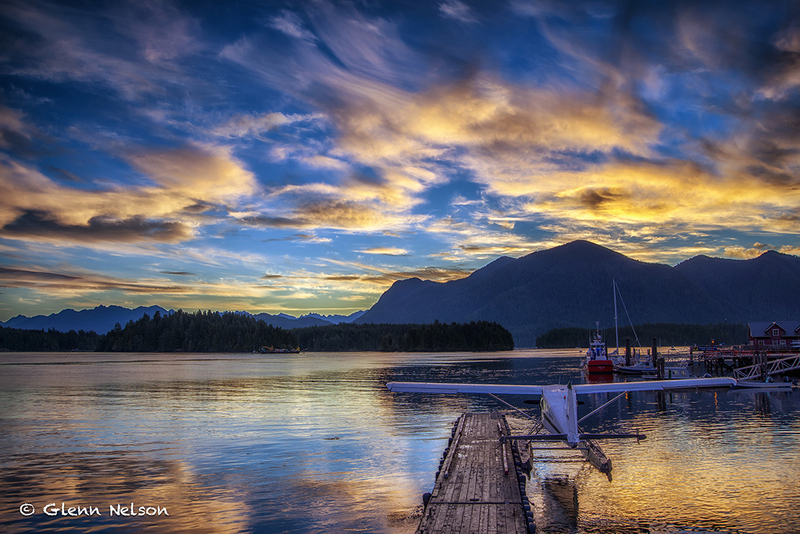 One morning I went into Tofino for the shot earlier in this post. Another, I drove about 30 minutes, into Pacific Rim National Park, down an unlit road to a totally desolate Grice Bay, which I’d figured out, great navigator that I am, faced East. But that day also was rainy and misty, and the cloud cover so thick, this was the best I could get. 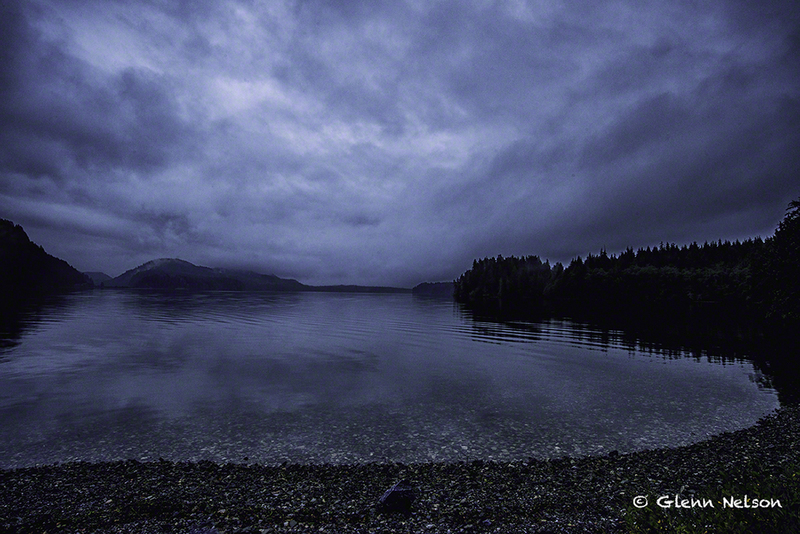 Sunrise at a very gray Grice Bay in Pacific Rim National Park. Yuck. And I tried everything I could think of to justify the trip. And enduring the rain. 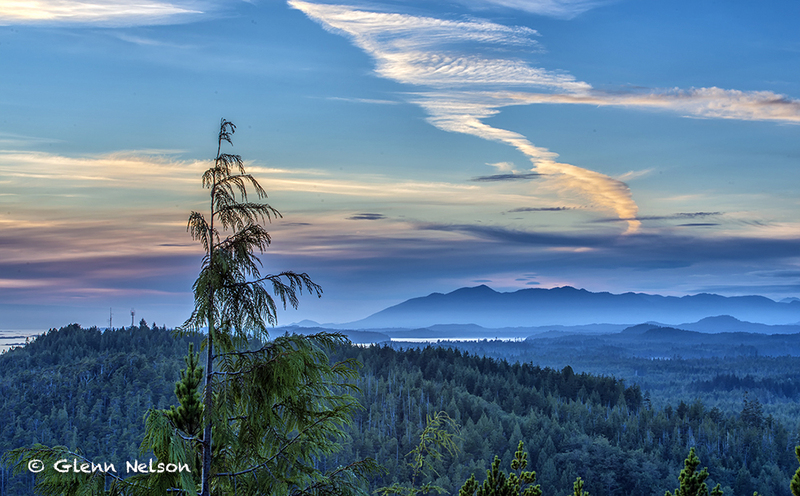 Another Pacific Rim National Park destination, Radar Hill, was touted as offering panoramic views of the area. I can see how it once might have. Until the trees grew over much of the views. The skies were interesting, but not captivating. So with truncated views, I came up with these. Sunset on Radar Hill, in Pacific Rim National Park. Another from Radar Hill, with Frank Island in the distance. NEXT: Missing the light – and some lessons learned.